A special limited edition cassette release of ENGLISH ELECTRIC is to made available in addition to the CD and vinyl releases on 8th April. The cassette release has been inspired by a recent revival in the tape format which has been championed by cassette-only record labels such as Blue Tapes and artists such as Grimes releasing special cassette-only releases. The cassette has also benefited from artists and labels taking an interest in releasing their music in this form for special events such as the forthcoming Record Store Day. The ENGLISH ELECTRIC cassette will also feature an exclusive bonus track titled Idea 7 which will not be available anywhere else. 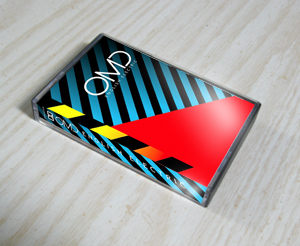 The cassette release will be available exclusively through the Official OMD Website and only 300 copies will be produced. As a bonus for Messages readers, the Official OMD Website has generously given us one signed copy of the album to give away in a special competition. More details soon. As most of you probably guessed, this post was purely a 1st April gag. Hope everyone found it entertaining!